The week before I left, three heads had been found on one of the beach where I was planning to stay. A few weeks earlier, a Canadian tourist had been shot in the lobby of her hotel by the crossfire of gang-related violence. That was the last time I was in Mexico, in 2006. I was 22 and headed to Acapulco, where I would embark on my first assignment as a travel writer. It was the first time I would have to travel alone and I was nervous, but more excited than anything. A dream-job was coming true for me. At the time, nothing could have been better than that. With absolutely no training whatsoever and one month to get the job done, I was going to have to pretend (pretty well, considering it would be published) that I was an expert on four different beach resort towns — their hotels, bars, restaurants, music scenes, art scenes, ecotourism options, gay scenes, weekend excursions, piña coladas (this part was particularly difficult), and the exhausting list of transportation options (to name a few categories). I had been to Ixtapa as a kid, which was partially how I got the job, but upon my arrival it became very clear very quickly that one week at a Club Med in fourth grade was probably not going to help me with this assignment. I was on my own — really on my own, for the first time — and it was as terrifying as it was thrilling. But so was being 22. That was seven years ago. When I think back, I realize I wasn’t really alone on that trip: Mexico was with me. When you travel alone in another country, you meet a lot of people (many of whom you don’t want to meet, particularly if you’re a female traveling alone), but you also spend a lot of time hanging out with yourself. At times, the only other companion you have is the country you’re in. During that solo trip to Mexico in the summer of 2006, I felt like I bonded with Mexico in a way I hadn’t bonded with another country before. It was my silent friend throughout a month-long journey. It shook during a brief earthquake, letting me know we were both there together, and it warmed my back during long days strolling through markets and side-streets while sampling different ice cream shops. During that trip, I explored my own character as much as I explored Mexico’s. I had to push myself to do things on a daily basis that felt totally uncomfortable, and I had to convince myself that I was an authority on so many subjects when I couldn’t have felt more like a freshly hatched chick in a foreign world. I grew up a lot during that trip around the state of Guerrero (now a major hot spot for drug war activity). I also formed a special connection with Mexico, the friend I spent every day with for four and a half weeks. When I left, I swore that someday I’d be back. 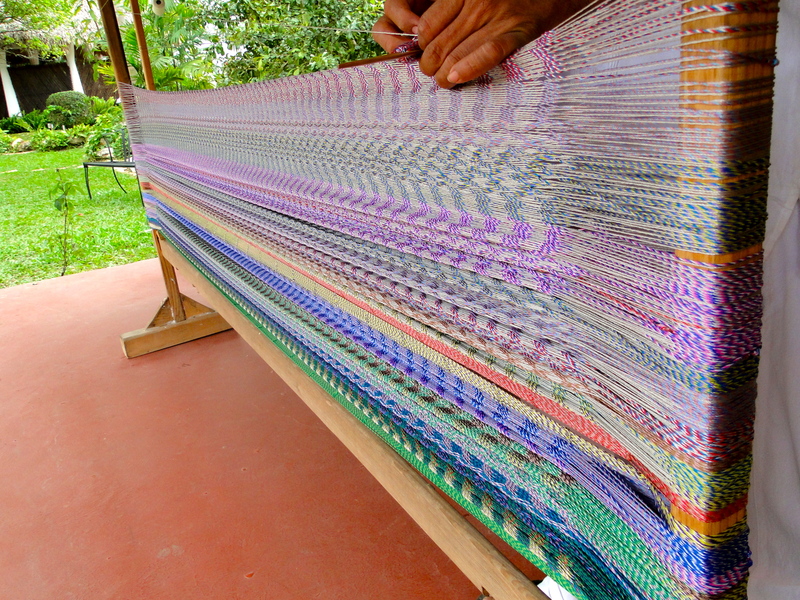 Making a hammock. Yucatan, Mexico. That “someday” was last week. A lot has changed for both me and Mexico, but one thing hasn’t: it’s still one of my favorite countries. Maybe it’s all the bonding time we’ve had together, but I find it misunderstood. When people think of traveling to Mexico these days, they immediately think “dangerous” and “drug wars.” Yes, these two things are a large piece of Mexico’s current reality, and you do have to be careful where you go and how adventurous you get. But — and this was my third trip to Mexico — I can honestly say that I never, at any point, felt unsafe or threatened by anyone around me. The Mexican culture, history, food and landscapes are really complex and beautiful beyond the surface. Granted, I spent most of this trip at a luxurious resort, but it is still worth mentioning that there are so many layers to Mexico worth exploring. I am guilty of misunderstanding Cancun. 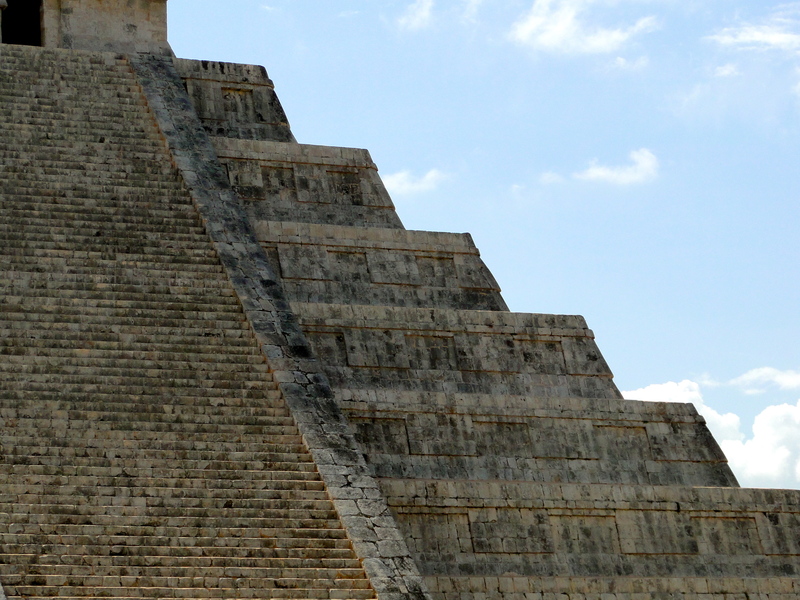 It was my first time in the Yucatan region, and I was hesitant to head this direction. Considering it has some of the best deals right now, I would have been silly to ignore it as an option. I am glad I didn’t. This time around, I was one of the “other” people — the vacationers, not the guidebook writer. I had every right to sit around and do nothing on the beach of a beautiful hotel that someone else had written about, but I tried to squeeze in some culture and history too. And this time around, my career has totally changed. I am now a few months away from beginning grad school to become a Doctor of Physical Therapy. In some ways, I am unrecognizable. But what about Mexico? Who had Mexico become since we last explored each other? Skulls. 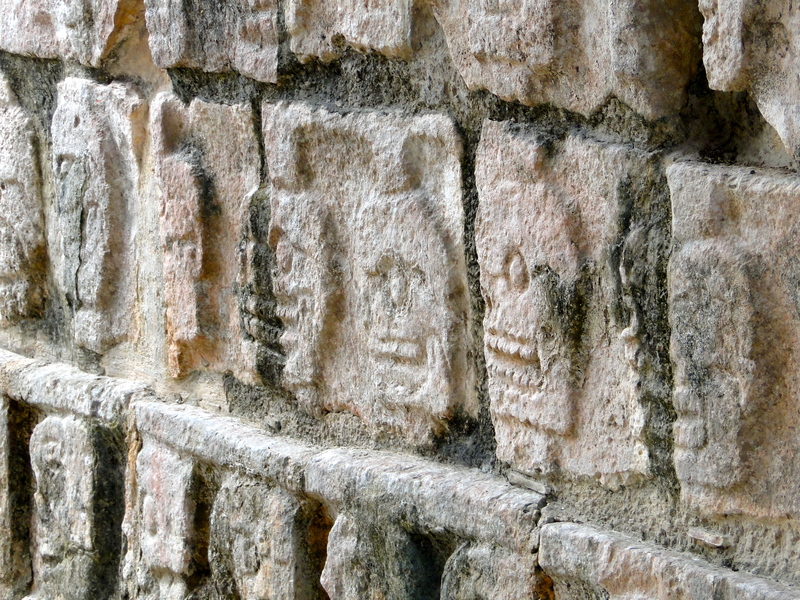 Chichen Itza burial site. Mexico. Before I left, I imagined Cancun would be seedy, dirty, run-down, full of bars with names like Señor Frog’s and Coco-Bongo, and with drunk American tourists to match. What I found was pristine, white sandy beaches with the most stunning gradient of blue water. Along with relatively responsibly-tipsy Americans, I encountered Brazilian, European and Mexican tourists lining the not-overly-crowded pool and beach areas, and gorgeous landscaping at every turn. It was clearly the off-season, and with much construction (brand new hotels and malls cropping up every 100 feet), I could see how crazy this island could get (did you know Cancun is an island?). But, thankfully, crazy wasn’t what I got during my trip. 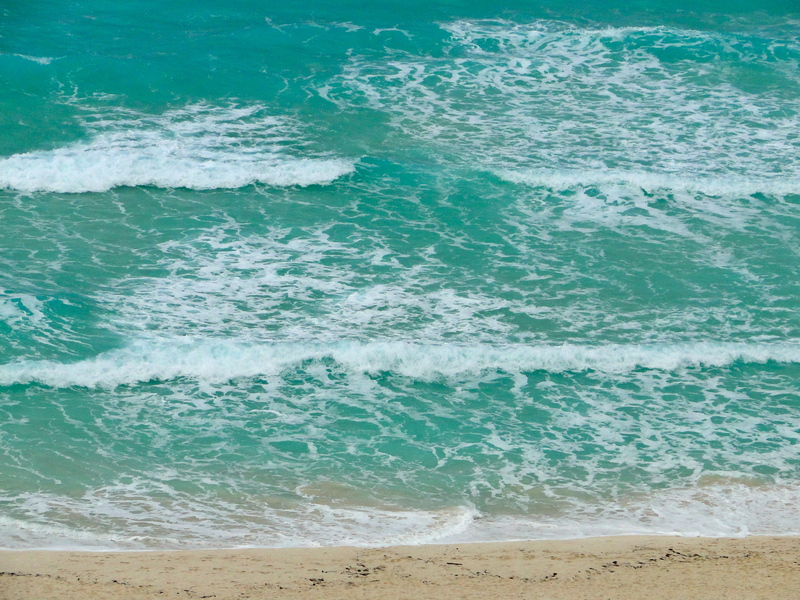 Words I’d use to describe Cancun based on my recent experience would be peaceful, beautiful, refreshing… and misunderstood, by me at least. Except for the unexpected cold rain during my first two days down there, I was happily surprised by most of it. Maybe Mexico was surprised with me this time around, too. I’ll write more about my visit to Chichen Itza in a later post. For now, I just wanted to quickly tip my hat to the Mexico I revisited. On my trip home the other day, a song came on the radio. The song was one that played all the time when I was in Mexico seven years earlier, alone and uncertain but thrilled to be doing what I was doing. I was on an adventure, if nothing else. This time around, as I listened to the song, I couldn’t help but smile: There I was — the same me, on a completely different trip to Mexico, awash in another adventure, but so much has changed. So many lessons have been learned and so many trips have occurred in-between. I couldn’t help but think about everything that had happened between that song then and that song now, like two book ends neatly holding together a collection of very different stories. When the song ended, a new one came on. It had no direct association to a memory of any kind, so I just listened. While the nostalgia from the previous song retreated into my mind like a giant, swirling wave, it left behind some fresh, untouched sand. I thought about switching stations, but instead I just let the new song play. As I listened, the first few footprints were made in the freshly cleared sand. I smiled to myself as I sat alone, with a crisp new tan already beginning to fade, feeling anything but alone this time around.